From field to supermarket can be a very long way. Beef cattle from the Scottish borders are sometimes killed and butchered in Cornwall, then trucked north to be sold in supermarkets in Newcastle. Kent cauliflowers are driven to a packing plant in the Midlands, then back to Kent to be sold a few miles from where they were picked. And there are dozens of other agricultural products that travel long distances before they reach the shop shelf. These food miles translate into energy consumption, pollution, greenhouse gas emissions, congestion, road deaths and much else, and they are on the increase. Between 1978 and 1999 the quantity of food shifted around the UK each year rose from 287 to 330 million tonnes, and the average distance travelled rose from 82 kilometres to 125 kilometres. By 2000, food-related transport accounted for a third of all commodity movements in the UK, and resulted in some 4 million tonnes of carbon dioxide emissions. Among retailers, Safeway has led the way in establishing one of the most efficient distribution systems, introducing a number of measures to reduce its food miles, reduce the energy consumption of its haulage fleet, and divert freight off the roads. Phil Coombes, transport manager at Safeway's regional distribution centre (RDC) in Welwyn Garden City, follows the progress of the centre's lorries, each of which carries a satellite tracking device, using a system called Logiq. "This gives us a whole range of information," he explains. "It tells us where each lorry is, how much fuel is being used, which routes to take to avoid congestion." All this helps the company to reduce the time its vehicles spend on the road and the amount of fuel they use. 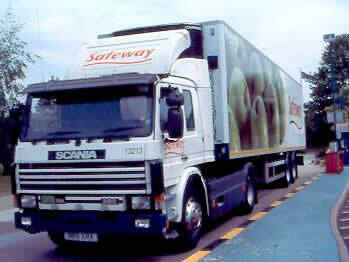 Eight hundred lorries deliver over 10 million cases of produce a week to 480 Safeway stores. Of the 42 based at Welwyn Garden City, 17 run on compressed natural gas (CNG). "We've found that gas is ideal for the sort of urban delivery work we do around London," explains Nicola Ellen. Vehicles that run on CNG are quieter than those which use diesel. They also emit lower quantities of hydrocarbons, carbon monoxide and particulate matter. The company plans to introduce more CNG vehicles to other regional distribution centres in the near future. Since March 1999 Safeway has operated a six-day a week rail delivery service from the Mossend rail freight terminal near its Bellshill RDC to Inverness. This serves its stores in the north-east of Scotland. In its first year, it enabled the company to avoid 1.75 million kilometres of road haul. This may not sound much when set in the overall context of Safeway's operations, but according to Ellen, "It is one per cent of what wasn't happening a few years ago, and no other retailer has developed a rail freight strategy like ours." Another measure introduced by Safeway to improve the environmental efficiency ofits distribution service is backhauling. Wherever possible, vehicles which are returning to the RDCs after delivering produce to the stores backhaul goods from suppliers, as well as used packaging such as cardboard and plastic waste, which is then recycled. 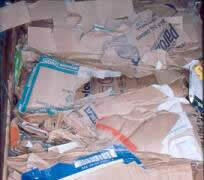 In 1991/92, the company backhauled 5 million cases. By 2000, it was backhauling 55 million cases a year, which helped to avoid some 6 million kilometres of road journeys. Environmentalists have long argued that the local sourcing of food will do much to reduce food miles, and that the retailers' RDC system encourages the long-distance transport of food. Ellen contests this. She argues that if all producers and suppliers were to deliver their wares directly to stores then there would be gridlock on nearby roads. In the mid-1980s, around two-thirds of Safeway's products were delivered direct, and if this system had remained in place, stores nationwide would now be receiving 120,000 separate deliveries - from 120,000 separate vehicles - rather than 10,000 a week, as they are now, nearly all coming direct from the company's network of regional distribution centres. Safeway's distribution system has much to recommend it, according to Tara Garnett, who coordinates Transport 2000's Wise Moves project, which is examining how retailers could reduce the distance food travels. "There is no doubt that Safeway has been a leader when it comes to distribution," says Garnett, "but it is important to distinguish between distribution and sourcing. Making distribution of food more efficient can yield some gains, but when seen in the context of the global food supply, they are almost negligible." In principle, says Garnett, it makes sense to source as much food as possible as close as possible to consumers, but the issue is not as simple as it sounds. Take, for example, tomatoes. In environmental terms one could be forgiven for thinking that it makes more sense for a London store to get its tomatoes from nearby Lea Valley rather than from southern Spain. "But if the Lea Valley tomatoes are produced in a hothouse," says Garnett, "then the amount of energy required to grow and transport the tomatoes may exceed the energy required to grow tomatoes in Spain in sunlight and transport them to the UK." Likewise, importing French apples might sound more sensible than importing apples from New Zealand, but transporting French apples by road actually requires greater quantities of energy per kilo, and emits more carbon dioxide, than shipping New Zealand apples to Europe by sea. Furthermore, New Zealand apples can be kept in storage for a maximum of three months, compared to six months for French apples, so the latter could potentially guzzle more energy than the former. But isn't it best to eat English apples, rather than either French or New Zealand? Perhaps, but if we also take into account other energy use related to production, such as the manufacture of pesticides applied, we may come to a different conclusion. "What we need to do is take a life cycle approach to food, and look at all aspects of production and distribution," says Garnett. Wise Moves has recently looked at the scope for reducing carbon dioxide emissions from the distribution of apples, cherries and lettuce. Its research reveals that CO2 emission savings associated with transport can indeed be made through local sourcing and better distribution, although not in all cases. In the examples studied, it was found that sourcing English apples rather than New Zealand apples cuts down on emissions. However, the cases covered by Wise Moves also suggested that sourcing local lettuces actually increases emissions if lettuces come from numerous small producers in the UK, rather than a few large ones abroad. Clearly impacts are likely to depend on the sales and distribution systems in question, as well as the product. "If there is one big message," suggests Garnett, "it is that air freighting of food is a major problem." Food now accounts for 13 per cent of goods shifted by air freight, which is by far the most polluting from of transport. Shipping a joint of Australian beef by sea is responsible for 343 grams of carbon dioxide emissions, whereas air-freighting a kilo of New Zealand blueberries is responsible for 10,738 grams of carbon dioxide, or thirty times more. Furthermore, consumers need to consider all sorts of trade-offs. Those who believe they are doing the environment a favour by buying organic food, or fish from stocks that are certified as sustainably managed, may actually be promoting food-mile pollution. A survey conducted by Sustain looked at retailer imports of organic food which could have been sourced locally: onions travelled 23,000 kilometres from New Zealand; spring onions 9,000 kilometres from Mexico; green beans 3,500 kilometres from Egypt. All of this means that in terms of energy use and pollution, organic produce can be more damaging than locally-produced conventional produce, although the latter may require more energy, and lead to greater pollution, on the farm itself. When it comes to certified fisheries, some of the largest are the most distant. Sourcing hoki from New Zealand may be great for fish stocks, but the fish have to be flown half way round the globe to UK consumers. Dramatically reducing the air freighting of food, and creating a more local system of distribution wherever possible, is not all that needs to be done. Getting food from the field to the supermarket racks up serious quantities of food miles, but then so does getting food from the supermarket to the home. Let us say you make a shopping trip of eight kilometres in an average sized car to purchase 30 kilograms of food. The amount of carbon dioxide emitted will be equivalent to the same basket of food travelling 952 kilometres by road in an articulated lorry, or 38 kilometres by plane on a short-haul flight. So consumers, as well as retailers, need to think about their food miles, and the problems they cause. Jones, A. 2001Eating Oil - Food Supply in a Changing Climate, Sustain and Elm Farm Research Centre, p31.